At the western end of Windsor Castle stands the Curfew Tower, the belfry of the College of St George. With walls 13 feet thick at the base and standing 100 feet high, it was built between 1227 and 1230 as part of the new defences of the Castle following the siege of Windsor during the reign of King John. In 1478 the decision was made to move the chapel belfry from the Mary Tudor Tower (now the residence of the Governor of the Military Knights) to coincide with the building of the new St George’s Chapel. The Curfew Tower was chosen as the new location. A massive timber frame over 50 feet high and 21 feet square was constructed inside the tower to support the bell cage, using planks from the old belfry. Treasurer’s accounts in the College Archives detail the expenditure on lead work, carpentry and iron work necessary for securing the bells in their new home. A clock was purchased from Windsor Parish Church for 6s 8d, mended and set up in the tower. This second hand clock evidently proved unsuitable because in 1490 Thomas Conygrave was paid £4 13s 4d for making a new clock. This was brought down from Westminster by water at a cost of 4s. “1689, 23 May. Agreed that since the old clock is quite worn out, that John Davis make a new one for the Colledg, and when finished that Sir Christopher Wren be desired to sett the price.”. This clock, engraved with the words JOHN DAVIS WINDSOR 1689 is the one which can still be seen on the tower, over 300 years since its installation. Eight bells hang from the lower part of the timber frame, which was recently preserved and repaired as part of the ongoing College restoration program. The bells originally brought from the old belfry consisted of a ring of five and three hour bells, and were known by the names Aston, George, John, Mary, Jesu, Edward and Wyrun, with the eighth unnamed. Over the years, these bells were recast, sold off to cover College debts or replaced, and the eight that hang there now range in date from 1612 to 1898. Structurally though, the tower remained little changed for centuries, until restoration work in 1863 carried out by Anthony Salvin. 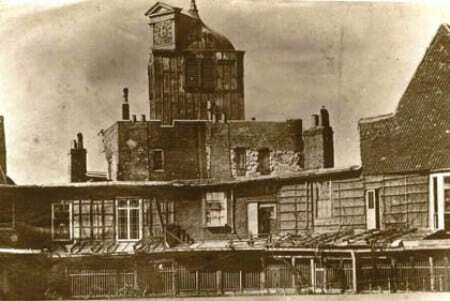 This photograph is of the Curfew Tower before the changes were made, showing the top part of the bell frame projecting above the tower parapets and covered in boarding and lead sheets. Salvin’s work included giving the tower a completely new stone face, raising the height of the upper walls and adding a large semi-conical roof modeled on one at Carcassone. The story goes that it was Emperor Napoleon III who suggested this new look while visiting Queen Victoria in 1855. Salvin’s alterations gave us the Curfew Tower that we see today, still fulfilling its role as the chapel clock and bell tower, as it has done for over 500 years.